It's about time to take a little break and waste some time, isn't it? I think so. 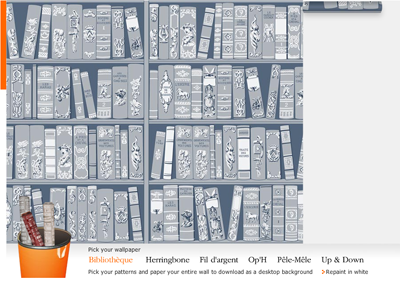 Head to the Hermès website and click the tiny picture of wallpaper rolls in a bin (the images will take a moment to load). Choose a pattern category at the bottom of the page. Then drag your favorite color from the bin to the top of the "wall" and pull it down to unroll the paper. Add more strips until the wall is complete. Download the pattern to use on your computer. My desktop is sporting a dark blue herringbone at the moment and looking quite dapper. Definitely a waste of time. Especially for how long it took me to figure out I had to use full screen to see that pattern category at the bottom, since I don't have a giant monitor like you do. ;) But pretty fun, though. Love you and can't wait to see you! What a cute way to "wallpaper" your desktop. Clever. how do i download the wallpaper after i create it? Oooooooooooooooooh, thanks!!! I wonder if I could use it as the background on my *very,very,VERY* neglected blog? Once you've covered the whole wall with paper, a link appears at the bottom next to the bin that says "Download your desktop background." Click it and the file will automatically download to your computer. Thank you! I'm loving my new desktop. Love it! I am on my way. great! loving the dark blue herringbone, too. I adore that website: it's full of gems and so beautiful! This would also look great in felt. downloading was a problem in Firefox on my Mac. Switched to Safari and download option appeared no problem. With complex sites like Hermes it's a good idea to try a different browser when you run into problems. BTW, went with the yellow/green Up&Down with a single stripe of the blue!